More than just giving you advice, we teach you and your team how to create and implement the tools, processes, and systems needed to take your business to the next level. From identifying the issues and challenges that are holding your company back to showing you how to acquire new business to providing you with the kind of insight and knowledge that only comes from over four decades of construction and contracting experience, we are here to help you achieve your business goals. One-on-One Coaching by the hour (Skype or by phone). The goal of this program is to get you through all the exercises, compiling your company’s owner’s manual and giving you the knowledge and competence to take your company to new levels on a continuing basis. This coaching program is done live online between you and a certified Nuts and Bolts Contracting consultant. Note that you will need a copy of the Companion Workbook and Owner’s Manual during this training. A Nut and Bolts Contracting certified consultant will guide you every step of the way to help you implement the principles and practices into your company through the exercises in the Companion Workbook. Generally, our students start with a one-hour coaching session to get to know their consultant and get all their questions answered. Then an agreement is made for what exercises you will complete before your next scheduled time slot. And it proceeds in this manner, coach – implement. Should you get stuck on something, you can contact your consultant to answer your questions and help you sort it out. Since participants will differ in their needs, you can get help with the particular section of the workbook that addresses your situation. If you only want help in finance that’s fine. You choose what you want the consultant to help you with. The goal of this seminar is to get your personnel to take ownership for the company and establish it into a smooth-running organization, operating on the standards and policies that you value for your company. Our highest priorities will be to empower your personnel to achieve optimal performance and help them understand how to continue to grow the company on a daily basis, as well as their own quality of life. This program is delivered live with a certified Nuts and Bolts Contracting consultant. We recommend that this training be delivered at your location because your personnel are in their environment, and you’ll save a boatload of money on travel and lodging. However, it is possible to have the training at our location if you prefer. The Nut and Bolts certified consultant will train your personnel and empower them to implement the principles and practices into your company through the exercises in the Companion Workbook and Owner’s Manual. The best way to utilize this service is to enroll and send us the names of the attendees and their positions in your company. 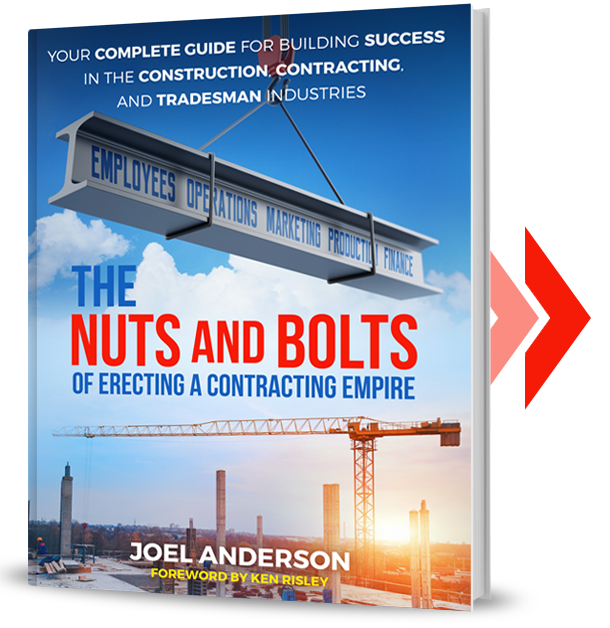 We will send the copies (up to 20 each) of The Nuts and Bolts of Erecting a Contracting Empire and the Companion Workbook and Owner’s Manual. You can then schedule the seminar for any day that is available. This process is done through e-mail and phone calls. If necessary, the consultant will call you to best tailor the seminar to give you what you need and expect. When you purchase the one-day seminar you will first receive a questionnaire which will help us tailor make the seminar for you and your company. Fill out the questionnaire right away and return it. We’ll take it from there. 1 Day Seminar Package plus applicable travel and lodging for the consultant.